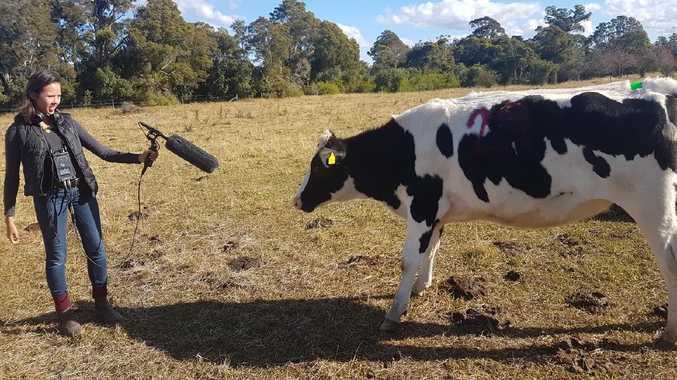 Field recording: University of Sydney PhD candidate Alexandra Green captures more of a heifer’s vocal repertoire. There are many dairy farmers who talk to their cows, even if they won't admit it. Some say they talk back. We all know they do, but what would farming be like if humans actually knew what the bovines noises meant? Well one University of Sydney researcher, armed with a microphone and the help of 18 heifers, is attempting to map out the vocal repertoire of dairy cattle, eyeing animal welfare outcomes. Dairy Science Group PhD candidate Alexandra Green has been working for 18 months on this research at the university farm at Camden, NSW. Miss Green said understanding the vocal repertoire of dairy cattle would help identify what the animals wanted, for example if they were hungry or on heat. The industry had technology that can identify cow behaviour such as rumination and oestrus, but Miss Green said understanding the noises made by cows during this time would improve the accuracy of the technology. She said the pig industry had mapped out the entire vocal repertoire of domestic pigs. "This information on vocalisation allows producers to apply acoustic monitoring technologies to improve the lives of pigs from birth to death," she said. The heifer vocalisations have been collected in the paddock. "Using microphone devices on cow collars, we can pick up a range of varied heifer emotions from anxiety to loneliness - even tracking the onset of oestrus as the animals come on heat." Ms Green received an Australian Postgraduate Award in March 2016 and funding from Dairy Australia following her undergraduate degree in Animal Veterinary Bioscience at the University of Sydney.